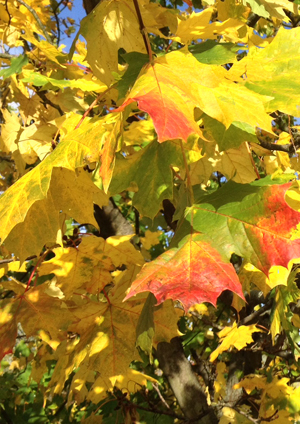 You are here: Home > Blog > Flora & Fauna > Changing Colours – Why do leaves change colour in the autumn? Come the autumn, the leaves of many deciduous trees change colour – no longer green they turn yellow, brown, red or purple. What has happened? When leaves unfurl from their buds in early spring, they are first a yellowy green colour and then green. This is due to the formation of large quantities of the green pigment - chlorophyll. Chlorophyll absorbs light energy and enables the leaves to convert simple substances, like carbon dioxide and water into sugars, starches and cellulose (the process called photosynthesis). However, chlorophyll is not the only coloured pigment in the leaf. There are other pigments – the carotenes and xanthophylls, which are yellow and orange but these colours are usually masked by the green of the chlorophyll. You can see the orange of the carotenes in a carrot quite clearly! With the onset of autumn, the days get shorter and cooler and this is a signal to the tree to prepare for winter. Leaves can become a liability – the tree is more likely to be damaged in high winds if it is in leaf. Also, when it is cold and the light intensity is low, then photosynthesis comes to a stop. So, in Autumn the chlorophyll in the leaves begins to break down and the yellow and orange pigments begin to show through. Reds and purples occur where other pigments called anthocyanins reacts with sugars. It’s the same pigments that make your apple red. 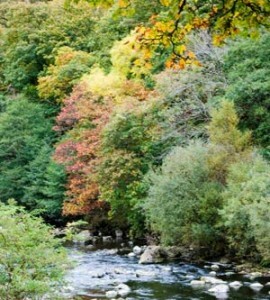 Trees such as sumacs, maples and dogwoods are particularly noted for their brilliant autumnal colours. People travel from all over the world to see the New England “Fall”. Colours are particularly intense where the weather is cold, dry and bright. At the same time as these colour changes are occurring in the leaf, so other changes take place. At the base of the leaf stalk, a special layer of cells forms (the abscission layer) so that the leaf will eventually fall from the stem, leaving a small scar to mark its existence. The shape and form of these leaf scars is one way in which winter twigs of different trees may be identified. Follow the development of this year’s autumnal colours across the UK at the Forestry Commission’s website. Cool map on the Forestry Comission web site. It reminds me of Japan, where the news ends with a weather forecast and seasonally a flowers or leaves forecast. During the cherry blossom season in spring they show maps of where the trees are blooming, during autumn season they show maps with red and yellow leaves on them. Would be a great idea for regional news elsewhere too, no? Have a look at http://www.naturescalendar.org.uk/seasonwatch . The Woodland Trust’s Autumnwatch is recording changes in leaves (amongst other things). Apparently oak trees now loose their leaves about a week later than they did 30 years ago. The colours of autumn leaves, and fruits.